Most of the smartphone users use data packages. Most of them do not have an unlimited data package. If such limited packs got expired then the service providers would charge you like anything. You may be ended up paying few bucks for data used over the pack limit. iPhone has come with a solution promoting its users to data less. 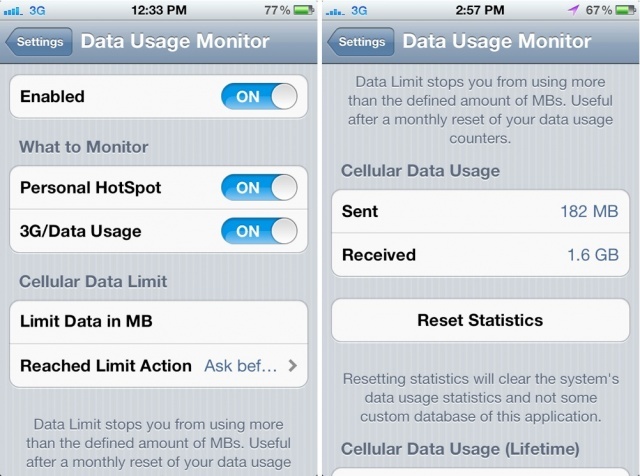 There are many ways to cut short this data usage in your iPhone. By following this you may be able to use less data compared to earlier times. Select the Cellular category in the settings of your Apple iPhone. From there you can see amount of data for current period. The only drawback is that this period won’t get reset automatically. So sometimes it may display the data used over months added up. This can be reset by way of ‘Reset Statistics’, which you may find at the bottom. You can also know the amount of data used by various apps for the same period. This will let you know which all applications are drawing more data. This will also let you know which all apps drains from your data on the background. Also check ‘System Services’ at the bottom to know the amount of data consumed by iOS. Sometimes certain apps use cellular data to update itself. Just change the settings and make them use WiFi to update. Also choose individual apps and restrict from use of cellular data. As an ultimate step, you have to go to Cellular Screen and select Cellular Data to switch off. This will cut down your data supply until you enable it. This may be a good solution if you use data only on rare occasions. Unless it will be annoying that every time you have to enable and disable it. Apps have its own options to control cellular data. For example user can prevent App Store from using cellular data and using them to download other updates. If you are using built-in Podcasts App, then you can direct it to download the episodes while you have WiFi access. Certain other Apps have their own options to reduce the cellular data usage. iPhone users are allowed to update automatically and also to download the download in the background. This could harm battery life also. By deactivating these apps can save your cellular data as well as from discharging your battery. To enable such options open up Settings App and go to Background App Refresh disable background app refresh feature. Cellular data can be saved also by disabling the push notification feature available in iPhone. The applications on the iPhone like emails, Calendar and Contacts are expected to use much cellular data for updating purposes.To check this you have to open Settings from iPhone and select mails, contacts and calendars and then select Fetch New Data. From there you can turn the option to get new emails and other data automatically to manually. This will ensure that the data is being used for these purposes when you allow it. The device may consume more data over a web browser. This can be cut down by using built in data compression proxy web browsers available in like Opera or Google Chrome. But in iPhones you do have Apple’s won web browser Safari to do the purpose. But unfortunately Safari won’t have the facility of compressing. This feature works like the pages you visit are sent to Google or Opera where they get compressed and sent back to you iPhone. These will definitely the data usage over your iPhone. Only disadvantage with this feature is that due to security problems, secure HTTPS websites cannot be sent through proxy web browsers. To avail this, open up Chrome and go to Settings option. Click on Bandwidth and enable Data Saver option to have this advantage over your iPhone. This can be an option to reduce data for fixed data plan users. Instead with streaming videos or listening to music, just cache those files to the gadget for offline with the help of application available. It would help to save data and also help to enjoy your favorite video or music. These could work in case of mapping app also, where the app can cache the local map and use it offline along with offline navigations also. These would save a lot of data that could have be consumed in downloading these.